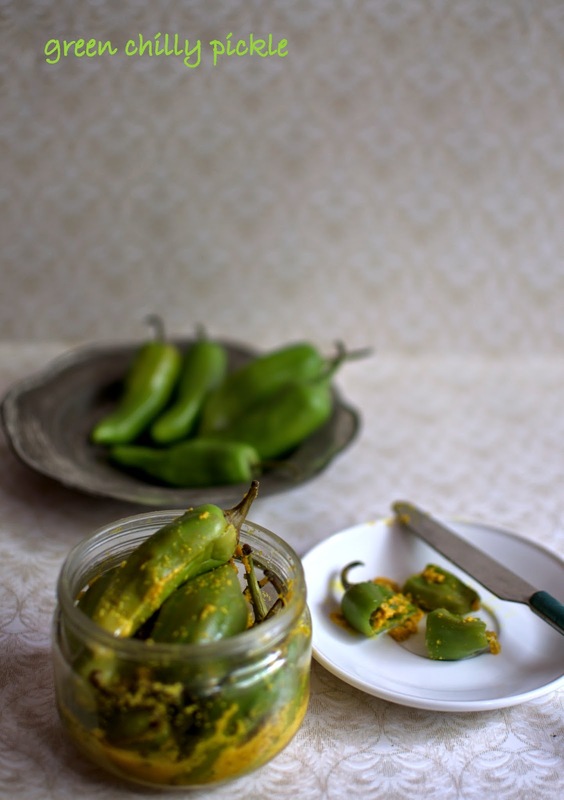 Green chilly pickled with mustard seeds or hari mirch ka sarson wala achar is an easy recipe that needs just a couple of days to get pickled. 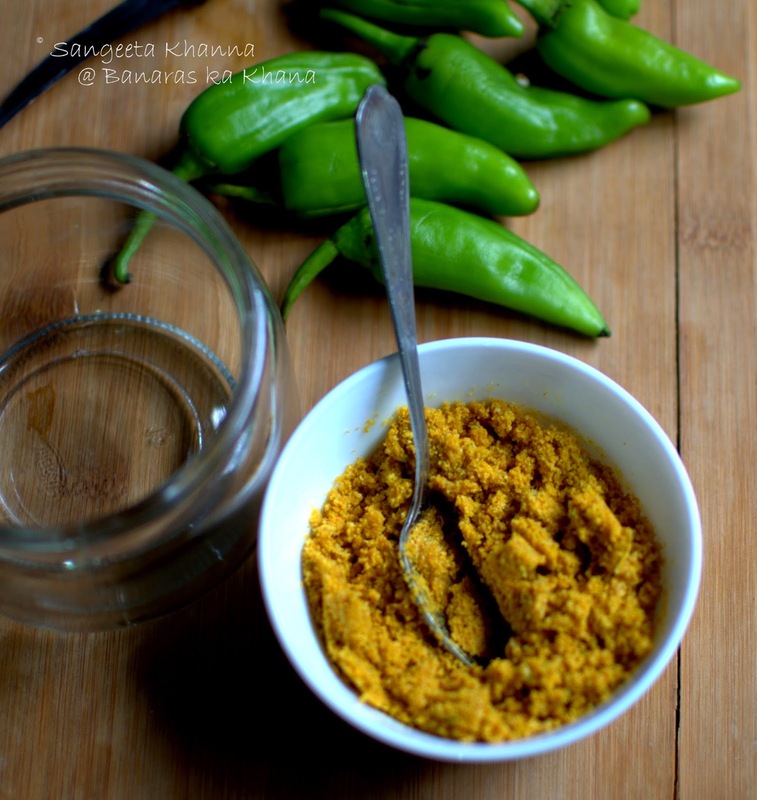 Mustard is a traditional pickling agent in north India and we use it many ways and making the hot chilies milder is one of the benefits of pickling with mustard. It helps ferment the pickling chilies first, makes them a little sour after a few days and then the sourness just kills the heat of chilies after about a month or so. Some people like it a month old when all the heat of chilies is gone and the pickle has gone completely sour. 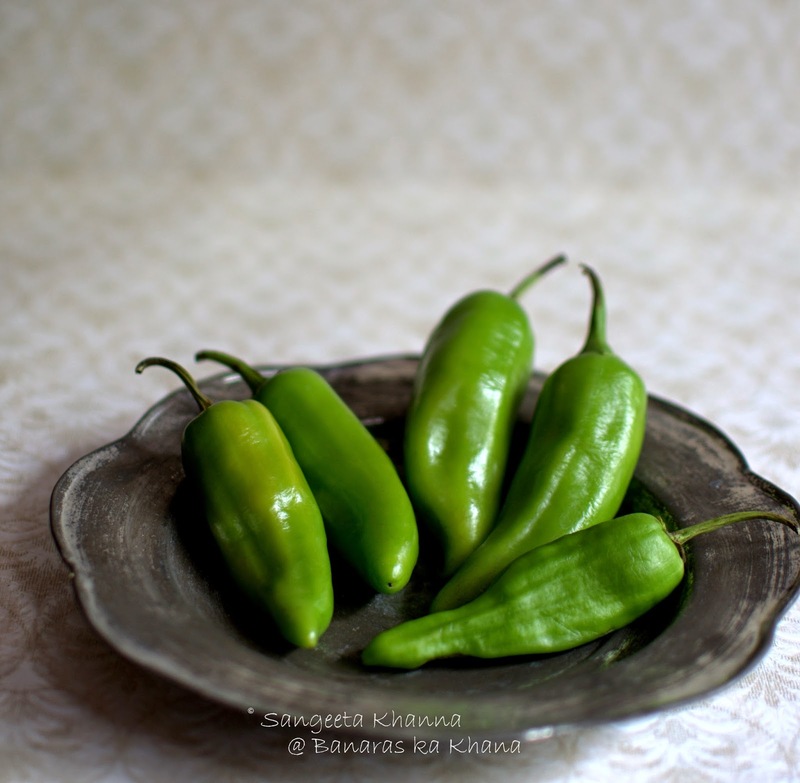 I generally add the soured green chilly pickle to some salad dressing or blend it in some dip or hot green chutney. 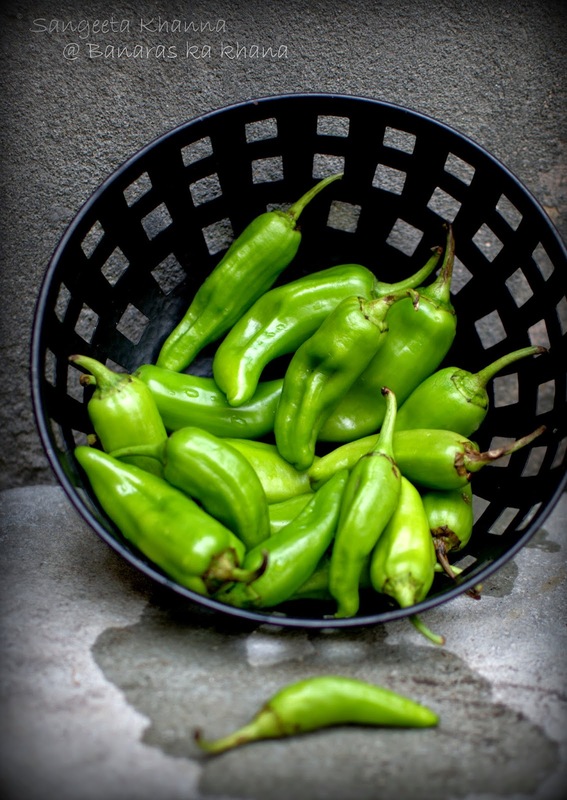 If you are pickling green chilies this way, make smaller amounts so it is over in about 2-3 weeks, or wait till the required sourness is achieved and refrigerate the pickle after this point, if something is left till then. 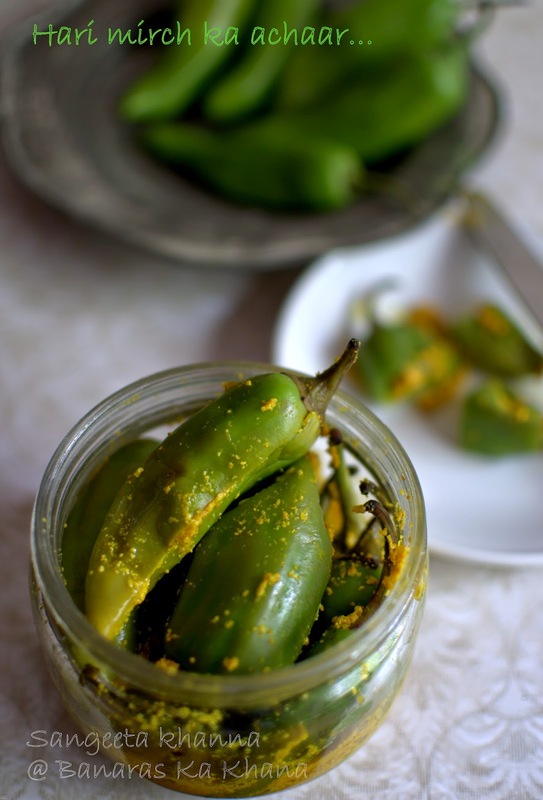 Mild jalapeno peppers are used for this pickle, but you can go ahead and use the hot jalapeno as well. Depends upon how hot you like your pickled chilies. Wash and pat dry the chilies. Make a slit lengthwise and keep aside. Powder the mustard and mix in the salt and mustard oil. Mix the mustard powder and oil well to make a crumbly mixture. Stuff lightly into the slit green chilies and bottle them. The chilies release their juice within 2-3 days and you would see a watery liquid in the bottom. Shake the jar once in a while so the pickling is evenly done. The pickle is ready after 2-3 days of pickling but keeps maturing for 2-3 weeks before getting too sour. 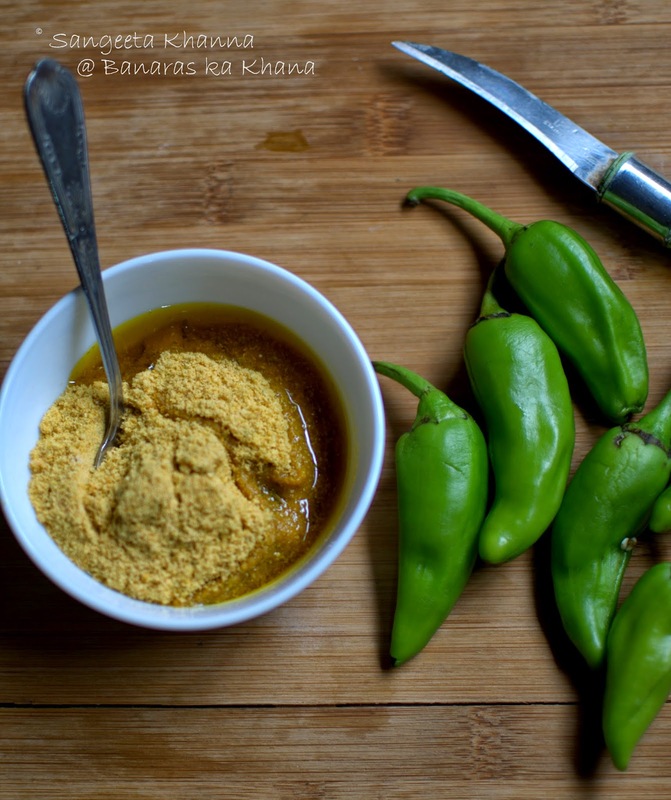 Serve this pickle with any Indian meal as a condiment or chop it and add to the salad you toss that requires a hot mustard dressing. You would see how versatile it is. When visiting Gurgaon and Delhi area a couple of years ago, had this pickle with Chole Bhature at some of the shops. And have been on the lookout how to replicate the taste back in states. This writeup was perfect and have now made and consumed three batches :). Planning to make fourth this week. That's a wonderful thing to know. Thank you for letting me know that the recipe was helpful.